Little, Brown Books for Young Readers, 9780316416863, 232pp. In Jason Platt's debut graphic novel, Ferris Bueller meets Calvin and Hobbes in this hilarious and embarrassing middle school caper that asks the important questions--like how long can one kid vamp before he embarrasses himself in front of his whole school? Newell is always getting into trouble--whether it's showing up tardy for most of the year, or mocking his teachers while authoritarian Mr. Todd is standing right behind him. When disaster strikes and Newell finds himself on track to summer school, he's given one last minute option to get out of it--participating in the upcoming Talent Show. The only problem is that he doesn't technically have a talent to show. Yikes. 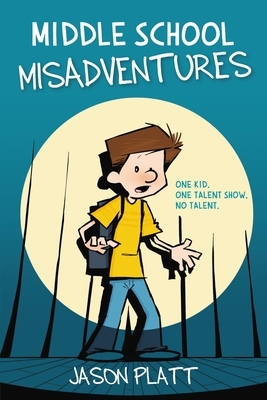 In this fun and imaginative full-color graphic novel, Jason Platt sends a fast-talking, daydreaming, middle school kid on a desperate quest to pull off a great show and save his summer. This title will be simultaneously available in paperback. Jason Platt is a graduate of the Savannah College of Art and Design, and in 2016, was accepted into the National Cartoonists Society by a unanimous vote. He is also the creator of the popular webcomic series Mister & Me. He and his family live in Davenport, Iowa.